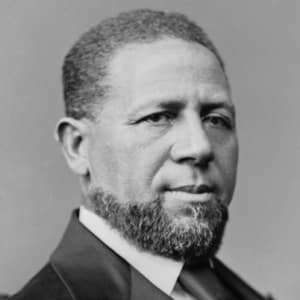 Hiram Rhodes Revels was born in Fayetteville, North Carolina, on September 27, 1827. Despite being born in the South in a time of widespread slavery, Revels was a member of a free family. He and his brother both apprenticed as barbers. Revels's brother subsequently owned his own barbershop. Upon his brother's death, Revels inherited and ran the shop before leaving North Carolina to study at seminaries in Indiana and Ohio. In 1845, he was ordained as a minister in the African Methodist Episcopal Church, working as an itinerant preacher. In 1870, the state congress selected Revels to fill a vacant seat in the United States Senate. Debate surrounding his eligibility hinged on the 1857 Dred Scott decision, which precluded African-American citizenship. The decision was effectively reversed by the ratification of the 14th Amendment after the Civil War. Democrats argued that Revels did not meet the nine-year citizenship requirement to hold congressional office given his ineligibility for citizenship through the war years. Ultimately, Revels and his Republican allies prevailed by citing Revels's mixed-race background, and Revels became the first African American to serve in the United States Senate. His appointment was particularly symbolic in that the seat he occupied had previously belonged to Jefferson Davis, the president of the Confederacy. In addition to his administrative and teaching roles, Revels remained involved with the Methodist Church, continuing to preach publicly until the end of his life. Revels died on January 16, 1901, while attending a meeting of Methodist ministers in Aberdeen, Mississippi.